Shop Smart offer: See in store for details. 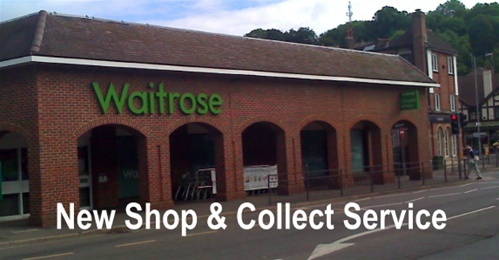 Waitrose in Caterham are one of the first branches offering a new Shop and Collect service. Visit and shop whenever it is convenient, then collect later the same day, up to 15 mins after normal closing time. You pay normally when you shop and we will store your goods until you can pick up later, from the delivery area at the rear of the store, to simplfy your shopping. See leaflets in store for full details, or ring above contact number. See leaflets for new Shop and Deliver, Online Shopping and other services too. Extract from Waitrose's Caterham store web site - check above for latest detail. Waitrose Community Matters. Every month this branch will donate £1000 between three local good causes that you choose. Please do make sure the local branch is aware of any of your local charities. How does it work? At the checkout you'll receive a token, which you then place in the box of the good cause you'd most like to support. The more tokens a cause gets, the bigger the donation they receive. You can also nominate good causes to be considered for the scheme in the future. Just pick up a leaflet in store for more information. Waitrose Caterham local products: A product is defined as 'local' if it is made within a 30-mile radius of the Waitrose branch where it is sold. Local products in Waitrose shops include sausages, bacon, ice cream, wines and cheese - all made largely from locally produced ingredients, free from unnecessary additives and are usually delivered straight to the branch by the supplier. At present more than 1200 local products from 450 local suppliers are available in nearby branches. Watch this site for details of local offers on a regular basis.